By Laura Hazard Owen @laurahazardowen May 5, 2016, 10 a.m.
That’s not to say, however, that they’ll actually finish your 10,000-word story on Russia (though publishers like The Washington Post and The New Yorker are working on ways to get readers to come back to long articles). 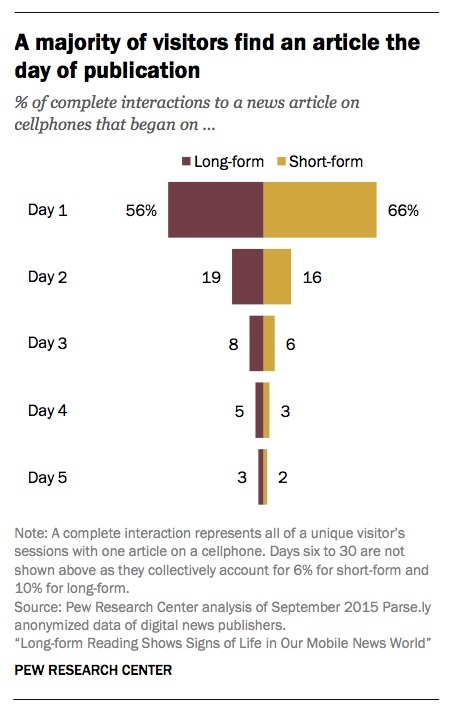 Pew worked with web analytics firm Parse.ly, which counts publishers like Slate, The New Yorker, Business Insider, and The Daily Beast among its clients, to analyze users’ time spent engaging with online news stories of varying lengths. The final dataset included 74,840 articles published by 30 U.S.-based news organizations (and Parse.ly clients), published in the six-month period ending September 30, 2015, “that met a minimum threshold of U.S.-based pageviews in the month of September 2015.” Visits from users outside the U.S. were eliminated from the dataset. 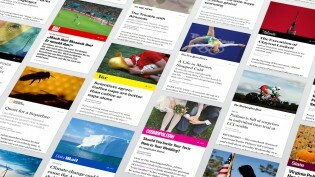 “Short-form” articles were defined as those between 101 and 999 words. “Long-form” articles were 1,000 words or more. Twenty-six of the thirty sites that were part of this study were mobile-optimized, she noted, but Pew found no statistically significant differences in engagement time between sites that were mobile-optimized and those that weren’t. This is true no matter how readers come to an article (from an external website, from social media, etc.) — but “those who follow a link on their phone from within the same website spend the greatest amount of time within an article”: 148 seconds (versus 111 seconds for articles referred by social media). 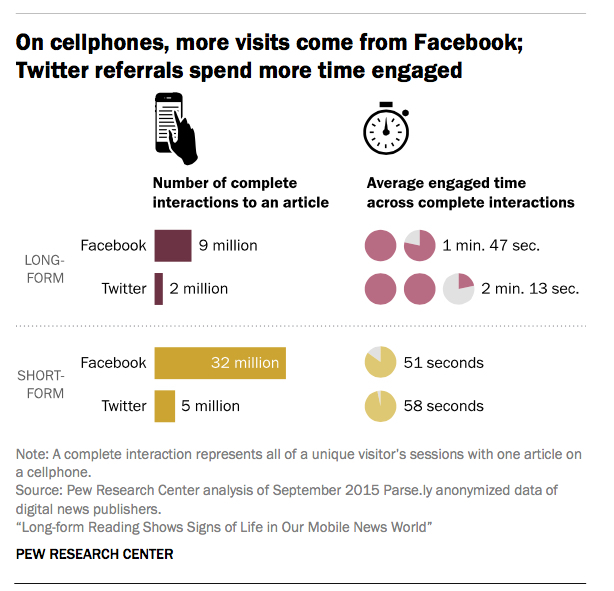 — Facebook drives way more traffic than Twitter, but users referred to articles by Twitter spend longer reading — 133 seconds, compared to 107 seconds for articles from Facebook. Other social networking sites drive much less traffic: LinkedIn, Google Plus, StumbleUpon, Reddit, Tumblr, and Pinterest combined make up 2 percent of total social referrals. — It is very unlikely that users who start reading a story (short or long) on their phone will return to it on that same phone. — The articles have a very short lifespan: Most readers find an articles, of any length, on its day of publication. — Engagement varies only somewhat based on time of day. “For both story lengths, the longest average engaged time occurs in the late night and morning hours.” However, “late night gets about 400,000 long-form readers per hour compared with 1 million or more per hour” during every other part of the day. — There is a slight difference between weekday reading and weekend reading. “On the weekend, morning time seems to have a little more staying power for long-form reading.” It seems that people who might once have read the Sunday morning newspaper in print are now snuggling up with their phones instead. Still, the research doesn’t provide a ton of evidence to support the idea of “leanback” times around which many publishers have pinned their tablet app strategies. — Time spent reading varies by topic — though researchers looked at only a random sampling of articles (3,118 out of a set of nearly 80,000) to draw their conclusions. 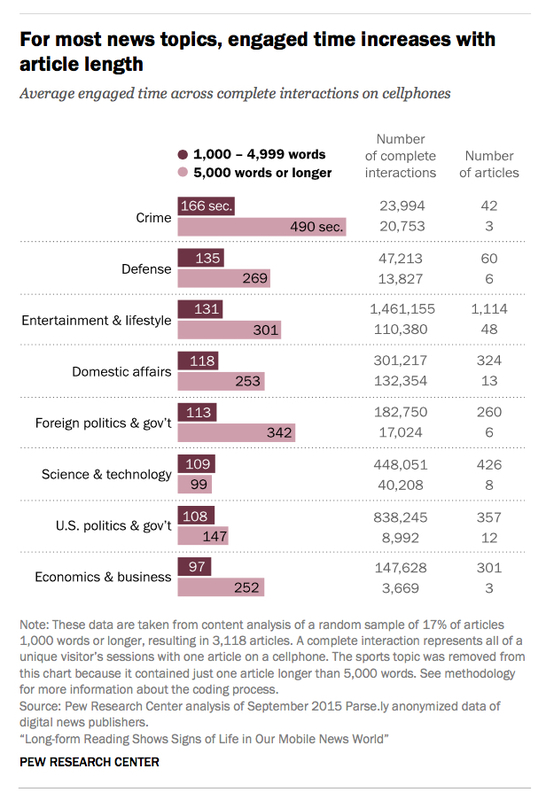 Super-long crime stories, for instance, saw particularly long engagement times, though there were only three such articles in the sample. 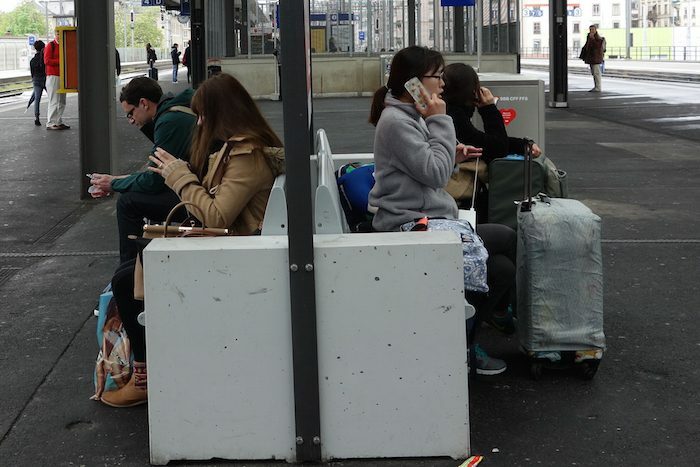 Image of people reading on phones by Nicolas Nova used under a Creative Commons license. POSTED May 5, 2016, 10 a.m.
Owen, Laura Hazard. "Good news, publishers: People will read your long stories on their phones (for two minutes, anyway)." Nieman Journalism Lab. Nieman Foundation for Journalism at Harvard, 5 May. 2016. Web. 19 Apr. 2019. Owen, Laura Hazard. 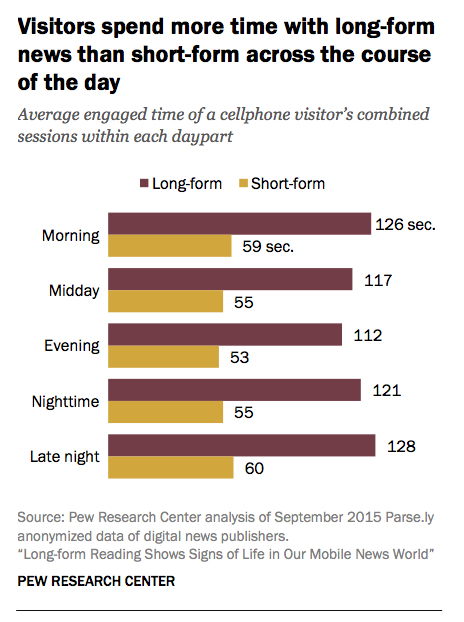 "Good news, publishers: People will read your long stories on their phones (for two minutes, anyway)." Nieman Journalism Lab. Last modified May 5, 2016. 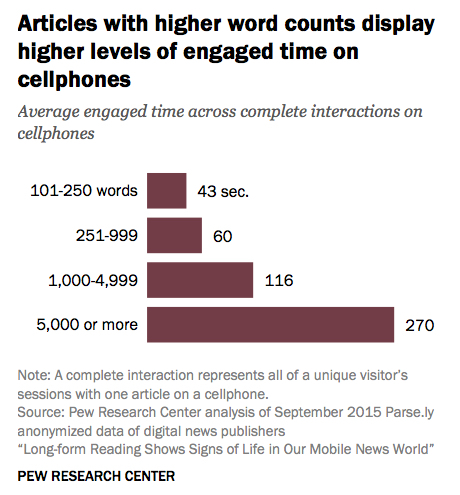 Accessed April 19, 2019. https://www.niemanlab.org/2016/05/good-news-publishers-people-will-read-your-long-stories-on-their-phones-for-two-minutes-anyway/.